You are here: Home / Estate Jewelry / You Had a Bad Oyster But do You Have Good Pearls? You Had a Bad Oyster But do You Have Good Pearls? I think that pearls are one of the finest pieces of jewels around. Think about how they are formed from a piece of sand or shell that gets lodged inside an oyster that it can’t expel. This doesn’t happen with every oyster and it doesn’t happen often, so truth be told, you have a better chance of eating a bad oyster than finding a good pearl inside that oyster. What makes the pearl even more amazing is that the nacre, which is the substance that the oyster secretes around the sand or shell, forms layers around the object to protect the inner soft recesses of the mollusk. There is a light that is reflected from these overlapping layers that produces the characteristic iridescent luster of the pearl and the process of building a solid pearl can take up to seven or eight years! Some myths were that pearls were the tears of the gods or dewdrops filled with moonlight that fell into the ocean and were swallowed by oysters. Early Chinese myths told of pearls falling from the sky when dragons fought and the Greeks believed that wearing pearls would promote marital bliss and prevent newlywed women from crying. Pearls are considered to offer the power of love, money, protection, and luck. They are also thought to give wisdom through experience, to quicken the laws of karma and to cement engagements and love relationships. They are thought to keep children safe. The luster of the pearl is the brilliance, the shine and the glow of the surface of the pearl, and the deeper the luster the more expensive the pearl. Pearls with a very high luster will generally show the following characteristics when viewed under a bare light with the naked eye. The luster of a pearl depends on the quality of the nacre-its transparency, smoothness and overall thickness as well as the thickness of each of the microscopic layers of nacre. There is no standard for luster, and like buying a diamond, look for what is pleasing to the eye. 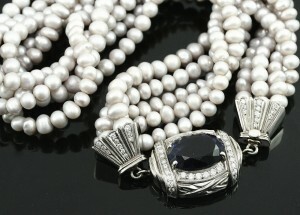 As an estate jewelry buyer, I am partial to certain name brands, such as Tiffany & Company and Cartier. I love when I get Tiffany & Company pearls. I also love Mikimoto pearls. Over the years, I have bought some beautiful Mikimoto pearls. The luster and the shape of the pearls are stunning, and it is so important to know how to take care of these precious natural gems that took so long to be made inside of those oysters. Pearls are soft and have a low resistance to heat and chemicals, which means that special precautions must be taken when cleaning them. After you wear them, just wipe them off with a soft cloth or chamois which can be dry or damp. This will prevent the dirt from accumulating and keep perspiration, which is slightly acidic, from eating away at the pearl nacre. Then, after you wipe them down, be sure to put them in a pouch and place them on top of your jewels in your jewelry box, instead of buried underneath, which will keep them from getting scratches and dings!